The allcomers’ race entrants flex their muscles as they prepare to brave the cold water. THE Christmas Day swim at the men’s pond on Hampstead Heath saw a bumper crowd shake off their festive hangovers to roar on brave and foolhardy competitors. 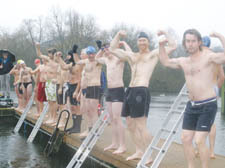 The water temperature was four degrees above freezing for the races, organised by the City of London and the Highgate Lifebuoys swimming club. The event, staged in a downpour this year, is made up of three races: one for Lifebuoys’ members, one for women and an all-comers’ contest. The 50 competitors who took part had to swim about 50 metres freestyle from a jetty to a rope and back. Winner of the Lifebuoys race was Golders Green chartered surveyor Dov Kritzler, who swims regularly at the pond. Instead of diving in, he gently eased himself into the chilly waters from a ladder, but his well-crafted breaststroke brought him victory by three lengths. The winner of the women’s race, Elizabeth Knowles, walks from her home in South End Green to the Kenwood ladies pond each day. Aran Murphy took the all-comers’ race.